Are You Leveraging Your Reference Check Data? Strategic HR Executives have learned that using data from employee reference checks – early in the hiring process – can yield valuable insight about a candidate, speed the hiring process, and improve hiring outcomes. Most experienced job candidates have an employment history that can help you decide if they are the right person for your organization. But when it comes to understanding how a candidate truly works, what skills they possess, how they compare to another applicant, and how likely they are to succeed in your organization – you might be missing out on important information. Many hiring organizations rely on just one person’s point of view – the candidate’s – from resumes, interviews and pre-hire tests to form an opinion about long-term hiring success. Wouldn’t you rather leverage insight from more sources – the people who have worked with that candidate in the past – managers, co-workers and direct reports? Learn how you can quickly get that kind of hiring data, plus many other benefits such as candidate reports, interview tools and a new source for passive candidates. 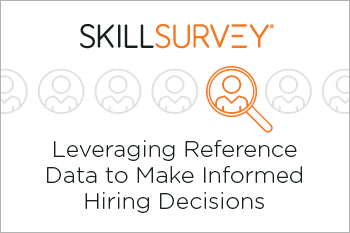 Download our whitepaper: Leveraging Reference Data to Make Informed Hiring Decisions.